A man who carried out an unprovoked attack on a couple in a pub - leaving one with a brain haemorrhage - has been jailed for nine years. 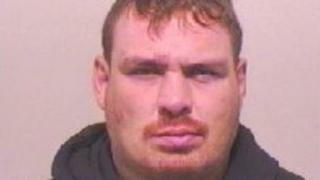 Ricki King, 34, attacked the couple while they were drinking at the Buffs Club, in Southwick, Sunderland, on 5 October last year. King, of Chestnut Crescent, admitted grievous bodily harm and causing grievous bodily harm with intent. Newcastle Crown Court heard that his victims were not causing any trouble. Det Sgt Gaye Martin, of Northumbria Police, said: "Ricki King is a dangerous individual who took the law into his own hands by carrying out a horrendous and sustained attack on the two victims. "The individuals were not causing any trouble but were targeted and bullied by King that night. His violent attack left both victims with horrific injuries and psychological scars that may never heal. "King showed little sign of remorse and refused to cooperate with police when he was arrested." Prosecutor Neil Pallister told the hearing that the woman victim returned from the toilet to see King shouting and acting aggressively towards her boyfriend. When asked why he was being violent, King said "because I can get away with it", the court heard. He then punched her in the face before setting upon the man who suffered a brain haemorrhage and a broken nose. He spent two weeks in hospital with head injuries, while his partner received stitches after suffering a cut to her eye.